Bokta 6143m or Boktoh peak is situated in the Kanchenjunga Himalayan range in the Kanchenjunga area at Taplejung District, Nepal, Located eastern part of Nepal. Bokta peak is of the chic trekking peak the height 6143m is open for climbing under Nepal Mountaineering Association (NMA) of Nepal. Bokta peak is the group “A” class climbing peaks. The main attraction of Bokta peak is panoramic views of Himalayan peak like Kanchenjunga 8586m (third highest mountain in the world), Jahnu or Kumbhakarana 7710m Dharma peak 6850m, Nupchu 6690m etc. Bokta Climbing offers fantastic Himalayan views of the eastern part of Nepal, including the third highest mountain of the world Mt. Kanchenjunga. Bokta peak is demanding and adventurous climbing peak of Nepal. Bokta peak climbing is apposite for those climbers who seeking a thrilling adventure in less crowded part of the Himalayan range. Previous climbing experience and good physical fitness are required for Bokta peak climbing. There are two options to reach Bokta peak base camp, one is direct flight from Kathmandu to Taplejung via Biratnagar and another is driven to Basantapur then start trekking towards the Kanchenjunga region and follow both base camp of mount Kanchenjunga, Pangpema and Oktang. Oktang base camp is closed to Mt. Bokta peak. The Bokta peak climbing route has been carefully designed to allow for gradual ascent and proper acclimatization by our climbing specialist. Best season for Bokta peak climbing is March to May and September to December. Bokta peak climbing arranges camping basis only. If given Bokta peak climbing itinerary is not suitable for you, we design another itinerary as per your desire as your time frame. We make Bokta peak climbing itinerary short and long, according to your demand. 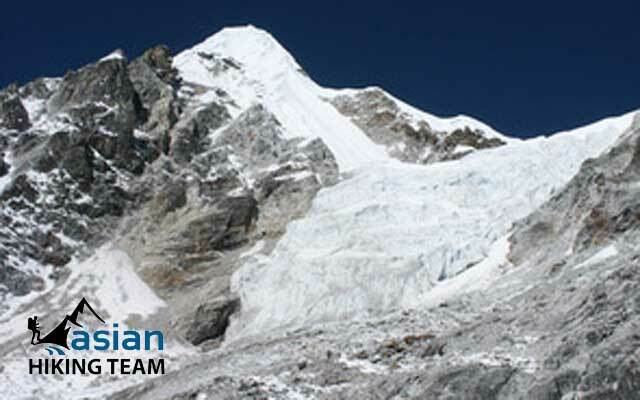 Bokta peak climbing can be arranged any time in the season as per your requirement. The Asian Hiking Team is arranging all necessary infrastructures to assist you for Mt. Bokta climbing attempt. Day 01: Kathmandu to Biratnagar to Taplejung (Suketar Airport) 2420 meters by flight, overnight Hotel/Lodge. Day 02: Suketar to Mitlung 921 m, 6 hours, overnight tea house/lodge. Day 03: Mitlung to Chirwa 1270 m, 5.30 hours, overnight tea house/lodge. Day 04: Chirwa to Sekathum 1660 m, 6 hours, overnight tea house/lodge. Day 05: Sekathum to Cyapla 2730 m, 5 hours, overnight tea house/lodge. Day 06: Cyapla to Ghunsa 3595 m, 4 hours, overnight tea house/lodge. Day 07: Rest day in Ghunsa, overnight tea house/lodge. Day 08: Ghunsa to Khambachen 4095 m, 5 hours, overnight tea house/lodge. Day 09: Khambachen to Lhonak 4785 m, 4.30 hours, overnight tea house/lodge. Day 10: Lhonak to Pangpema (Kanchenjunga Base camp) 5100 m 4 hours, overnight tea house/lodge. Day 11: Pangpema to Khambachen, 3/4 hours, overnight tea house/lodge. Day 12: Khambachen to Ghunsa, 4/5 hours, overnight tea house/lodge. Day 13: Ghunsa to Sele La pass base camp 4290 m, 5 hours. Day 14: Sele la pass base camp to Tseram 3870m, overnight tea house/lodge. Day 15: Tseram to Ramze 4580 m, 4 hours, overnight tea house/lodge. Day 16: Rest day in Ramze, overnight tea house/lodge. Day 17: Ramze to High camp 5573m, 4/5 hours. overnight at Camp. Day 18: Rest day in High Camp, Fix rope and preparation for summit, overnight at Camp. Day 19: High camp to summit Bokta Peak 6143m back to Base camp, overnight at Camp. Day 20: Base Camp to Ramche, overnight tea house/lodge. Day 21: Ramze to Torontan, 2995m, 5/6 hours, overnight tea house/lodge. Day 22: Torontan to Yambuden, 5/6 hours, 2080m, overnight tea house/lodage. 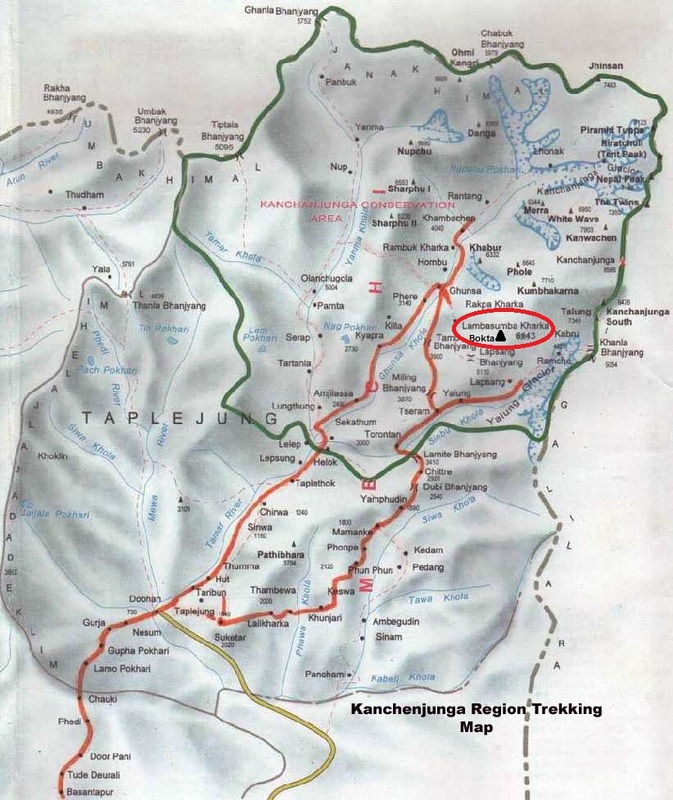 Day 23: Yambuden to Tellok, 1500m, 5/6 hours, overnight lodge. Day 24: Tellok to Lali Kharka, 4/5 hours, 2265m, overnight lodge, tea house. Day 25: Lali khadka to suketar, 2420m, 3/4 hours, overnight lodge/guest house. Day 26: Suketar to fly back Kathmandu, transfer to hotel.